Only 3 days after posting handspun project #1 for 2012, here I am with handspun project #2 for 2012. Impressive, non? The pattern is Wurm but with fewer repeats of the main section. This was a design decision, as Hannah wouldn’t have liked such a floppy hat, and also a necessary modification as I wouldn’t have had enough yarn to knit all those purl ridges. Of course I do not remember any details about this particular yarn. It’s probably either Spunky Eclectic or Hello Yarn but honestly, it escapes me. It is fairly bulky, though, and the colors are favorites of Hannah’s. Speaking of Hannah, she’s having a wonderful week in Florida, wearing a bathing suit instead of a hat. She’s going to be staying a little longer than planned, too, since her flight home for Sunday was with Direct Air and they suddenly suspended all flights as of yesterday. Luckily I was able to book her on a somewhat reasonably priced flight home next Tuesday with JetBlue. So now I’m out a couple hundred bucks and she gets 3 more days in Florida. P.S. Please send positive vibes for a safe and uneventful trip home for her, would you? Thanks. Great hat, ouch on the plane ride, Thank God she’s with Brant at least you’re not scrambling for hotel space too.I wll definately try to send some posative vibes. Sending good vibes for Hannah’s safe travels! (A similar thing happened to Erin last year; she also ended up with several extra days in Florida and I was out the $.) The hat is perfect — and looks great on Hannah. The way the weather here has been lately, she’s not going to need that hat in Massachusetts, either! Good vibes for an uneventful trip home … at least she’s staying with family. 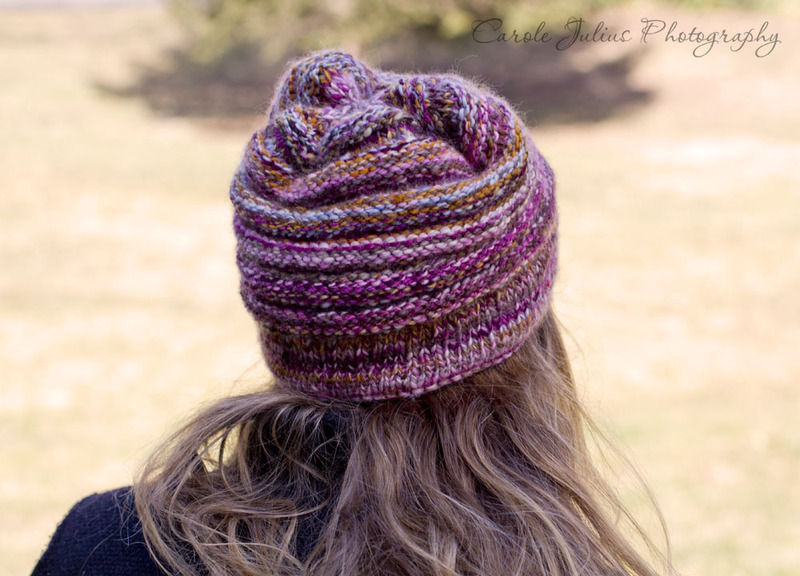 OK, now I need to knit that hat… Your handspun is beautiful! Her trip back will be great. No worries! At least she looks extra cute in the hat, takes the sting out of the injustice, doesn’t it? lol Love the colors, your girl has great taste! Love the hat. Great yarn. Your knitwear model looks as cute as ever. Sorry about the $$. I saw that about Direct Air! Aaack! The hat is beautiful…almost makes me want to learn to spin. Not!! 🙂 Safe travels to Hannah! The handspun is so lovely – as is Hannah and her new hat! As my Uncle Dave always says to me, “I wish (Hannah) Traveling Mercies.” Happy Thursday, Carole! Adorable hat and colors too. Well done! A cute hat! I hope Hannah gets home safely ( I’m sure she will). We always worry about our kids, don’t we? Sorry about the bad flight experience! Hope everything ends up well. Love the hat! I really like the Wurm hat I made, though it doesn’t have as much character as yours. Hope the rescheduled flight goes smoothly. Good wishes sent (not sure where they go, but expressed, anyway.) Very cute hat. My daughters suffer from itchy forehead, so their hat hems have to be knit with cotton or lined with baby fine polar fleece. Love your Wurm mod. I’m writing that down – I have the pattern but haven’t knit it because it’s too floppy. Yikes on the air travel! Well, it looks like loving the colors (which I do) amounts to joining a pack. the hat looks dariling on Hannah and the style is great. Safe travels to your precious girl! The hat looks cute! 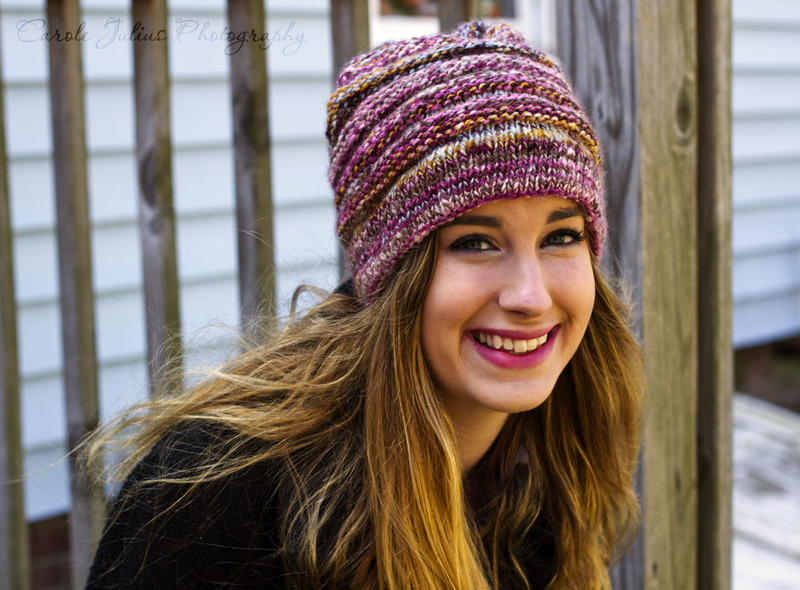 Hannah is lucky this week – 2 handspun, handknitted gifts and an extended vacation in warm FL. I just texted my dad about Direct Air. He has been using them all winter to go to down to his house and has another flight scheduled next week. He said he already re-booked with Southwest but of course, it’s more expensive. I will keep my fingers crossed for Hannah to have an uneventful trip back. What a cute hat. Fingers crossed Hannah has a safe trip home. Cute hat. Fingers crossed, though I feel safer that she’s on JetBlue instead of on DA despite the extra $$’s. The hat is precious … I’m sure Hannah won’t mind a few more days soaking up the rays on the beach. I hope her flight changes work out. My youngest is also at the beach this week (Destin)… Glad she is close enough to drive back to school and didn’t get caught up in the airline nightmare! Oh, that looks great on Hannah, lucky lady! Hope she has a safe trip home! Cute hat! 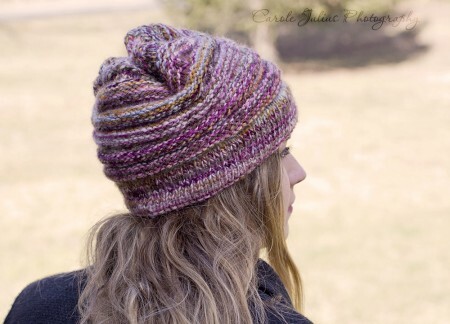 I’ve been searching for a pattern to knit a hat for my niece and Wurm might be the one! At least Jet Blue has positive customer relations! Wish I were stuck in Florida for an extra few days – oh wait, it’s hot enough here thankyouverymuch! Love the hat. I must go spin more. And, loving the hat you knit for her! It looks great on her! Cute hat! But then again everything looks cute on Hannah! Ah the woes of spring break travel. Could I tell you stories!! Wishing Hannah safe travels home! I’m sure it will go well. That’s a great hat. Hannah is super photogenic! No justice. Everything looks beautiful on her.